The page below was written several years back. If you’re looking for confirmation of whether the Minster bells will ring in the New Year this year (31 Dec 2016) – it seems that they will, according to the official York Minster Twitter account, and a tweet this afternoon, 31 Dec. It must be five years or more since we bothered to head for the Minster to see in the New Year, but we decided to do a last-minute dash up Bootham. Many other people were dashing in the same direction. We ended up at the end of High Petergate, part of the massive crowd. This was how it looked above our heads. 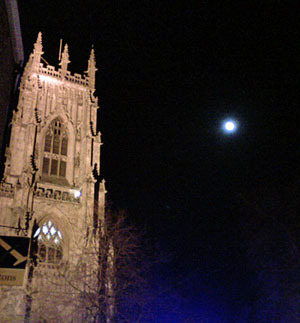 Beautiful Minster, beautiful moon, spiritual, hopeful. 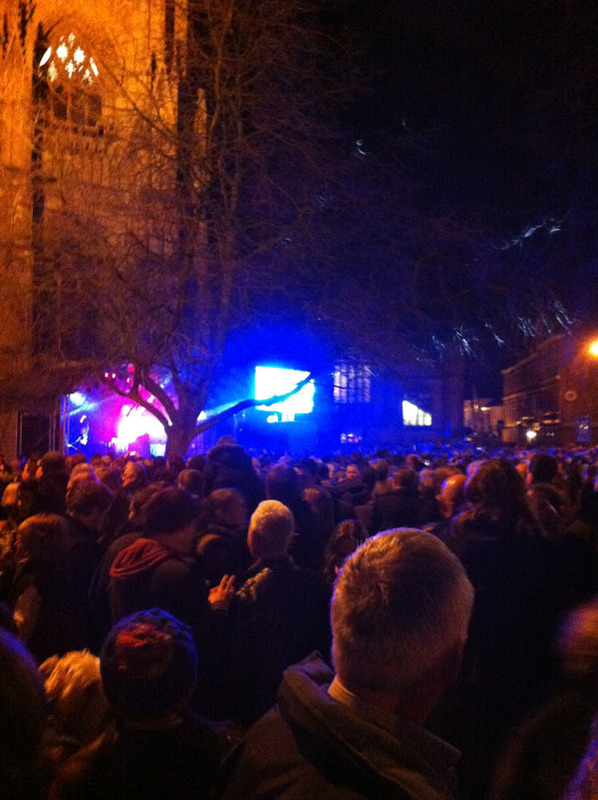 This is how it looked below, with a brightly lit stage on the steps of the Minster, a screen on the open area in front of St Michael le Belfrey, and the crowd filling all the spaces in between. It was certainly jubilant. And loud. And the same old happy drunken jumble. A woman in front of us staggered and headed for the pavement. Her friend caught her and led her to the nearby wall of the York Arms, somewhere solid to lean. The point of being there was to be closer to the bells as they rang. I assumed this would be a more impressive sound than hearing them from our back garden, as we’ve done in recent years. But no, not really. They were in there somewhere, briefly, seemed barely audible, and appeared to no longer play a lead role in proceedings. I thought this was just the way it was now, and that maybe it was just me who found it a bit disappointing. It was only the following day, reading comments on Twitter, that I realised it wasn’t just me, that others were disappointed, including John Ridgeway-Wood, one of the bellringers. It must have been even more frustrating for those doing the ringing. Their ringing is the reason we’re all there, after all. The DJ and the live music could happen anywhere. Maybe they could stage that in St Helen’s Square near the Mansion House next time, and separate the raucous party thing from the more cathedral-based thing. Just a thought. Maybe we’ll just stay at home again next year, and listen from the back garden for the Minster bells. They’re faint, of course, but a hopeful and happy sound, drifting over to us from the centre of town. Out here, one year, I also heard another church bell, at midnight, joining in, from an unidentified church in the Clifton area. That was rather nice too, and more moving than this New Year, with what one tweet memorably described as an ‘alienating cacophony’. Ten years or so ago, I remember a group of us leaving a pub on Monkgate on a mad last-minute dash to get to the Minster to hear the bells, onto Deangate, with the massive sound filling the space. It was full of people then too, but still those bells were the centre of it. Not any more, perhaps. It seems a fairly recent thing, this tradition of ours of gathering around the Minster, listening to the bells ring. Or at least on this scale. I’m also a bit unclear on whether the bells have always been rung to welcome in the New Year. Googling for further information has led me only to a snippet or two suggesting that the bellringing for New Year was banned in 1936 as police had been concerned about ‘hooligans’ throwing bottles at the windows. And that this ban perhaps stayed in force for some decades. If you know more, please add a comment below. On the way home this year we were discussing memories of earlier New Year’s Eve celebrations, centred around the York Arms, which was our favourite pub in the late 1980s. If you were in the York Arms before midnight you could get a ticket as you left which allowed you to get back in after the bells had rung, for more drinking and partying. But what I remember is I think before the bells became a focal point for widespread celebration. This is how I remember it anyway, one of my most memorable and special York moments. I was looking for a friend I’d lost, as the New Year moment was upon us, and was standing in the doorway of the York Arms, looking out, as 1986 turned into 1987, as the Minster bells started ringing. As I remember it there was no one else around, no crowds. I don’t believe I had an expectation of hearing the bells ring, as I recall it was a complete surprise. That suddenly it was just the sound of bells across that paved open space, just me and the Minster bells. I’d had a lot of family problems. I’d left home, left education, lived in various bedsits, ‘gone off the rails’. In 1985 I’d gone back to education, to York Sixth Form College. I was still living in a bedsit, and didn’t have the conventional family support, but powered by youthful arrogance I decided that I wanted to follow in my sister’s footsteps, and take the Oxford entrance exam. ‘I’ll show them!’, etc. And in December 1986, a couple of weeks before the year’s end, I’d got the letter saying I’d got my Oxford place. I’d be leaving here for the dreaming spires before the next New Year. It felt like the bells were ringing for me. It may be that the momentous event in my own life associated with that New Year’s Eve has made me turn it into something resembling a scene from a film. There may have been crowds there and selective remembering may have removed them. Anyway, no New Year now could compare with that, could it. By accident rather than design we ended up, at midnight on 31 December 2012, standing near the same door of the York Arms. In 1986, open space. Now, packed with people. Then, the Minster bells. Now, music, drumbeats, a DJ shouting, Auld Lang Syne belting out with people singing along, Minster bells in there somewhere. Comments welcome, particularly from anyone who has further information on the recent history of this tradition. And thanks to the Minster ringers. Hoping that in future New Year celebrations those bells get the respect and attention they deserve. Wishing you, dear readers, all the very best for 2013. Was it traditional? – video by David Dunning. John Ridgeway-Wood, mentioned above, talks about those drowned-out bells. An earlier celebration: New Years Eve 2010 at York Minster, by Khaoz Media. That one looked quite good. Shame we missed it. Celebrating the arrival of a New Year in the shadow of such a magnificent and ancient building, a building that has witnessed so many New Year’s Eves with so many generations of York residents, was part of that ambiance, a tangible sense of ‘place’ and the passage of time.